Chris Trotman/Getty Images Look for Patrick Peterson to make an immediate impact on the Cardinals ... and "Madden NFL 12." I've been obsessed with cornerbacks ever since I first saw Lester Hayes dip his hands in a bucket of Stickum. And growing up in the Bay Area, I've seen some greats run by me backwards, from a young Ronnie Lott to Mike Haynes to even a season of Deion Sanders. 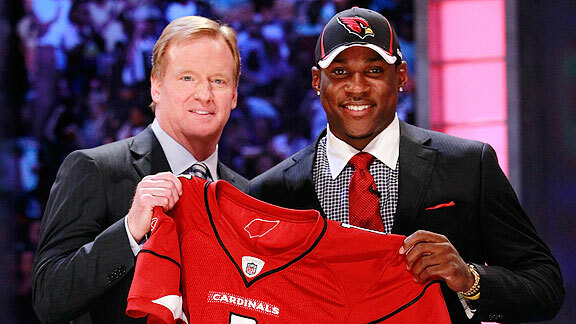 Next in line to go "primetime" is the Cardinals first-round pick, Patrick Peterson. With P-Squared, we're talking ball hawking, blanket coverage, and the type of return skills that make you think back to the days of Deion dripping in jewelry. But I'm not the only one high on Peterson, as "Madden NFL 12" ratings guru Donny Moore has informed me that Arizona's electrifying corner will be the highest-rated rookie in the game with an 82 overall, including 97 speed, 96 agility, 93 acceleration, 93 jumping, 77 catching (highest for any rookie CB), and 91 return. In terms of his defensive skill set, Peterson clocks in with 89 man coverage, 82 zone coverage, and 90 press. 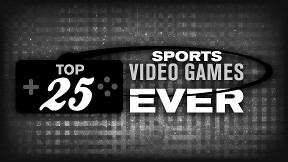 Not bad for a kid who grew up gaming, dreaming of the day when he'd finally see his face in the "Madden" franchise. "I have the PlayStation 1, PlayStation 2, and the PlayStation 3, and when Sony comes out with another system, I'll get that one too. I guess I'm just a PlayStation kind of guy." Jon Robinson: When the player ratings come out, how serious do you take it? Patrick Peterson: Once the game comes out, that's what everybody looks at, whether you're a fan or a player. You immediately go to the depth charts and try and see what the numbers are. There are all kinds of guys in the locker room like, "Ah, they didn't get this right!" But it's all fun and games. Jon Robinson: Any advice for EA Sports in making your "Madden 12" character? Patrick Peterson: Just make me really, really fast. As someone who plays the game, I know, you need cornerbacks with speed. Make me one of those guys everyone wants on their team. Make me a shutdown guy. Derick E. Hingle/US Presswire Another day, another interception for "Madden's" top-rated rookie. Jon Robinson: What was the whole draft process like for you? It's not everyday you have 32 doctors pulling on you from different angles. Patrick Peterson: That was definitely something new. [laughs] The doctors were pulling on me each and every second. The process was fun, though, and you just have to go in and enjoy the moment. Jon Robinson: What were some of the crazy questions teams asked you as part of their evaluations? Patrick Peterson: I got the usual, like would you rather be a dog or a cat. But then I got this one as well: What's the difference between a pen and a pencil? Do you know? Jon Robinson: What does this have to do with being a shutdown corner? Patrick Peterson: I have no idea. They asked me what's 7x3, how many days are in a year ... all kinds of things like that. Luckily, I passed that test. Jon Robinson: Cornerback might just be the toughest defensive position to play in the NFL. What does it take mentally to be a shutdown corner out on the field? Patrick Peterson: You have to not only be a competitor, but someone who wants to get better at their craft every time you go out and step onto the field. You need to have that confidence, that swagger to know that you're trying to be the best, and it doesn't matter who you're lining up against, you know you want to get the best of him. Jon Robinson: Is there a corner in the NFL you look up to? Patrick Peterson: Actually, I look up to a few guys. Charles Woodson is one. I think he's a phenomenal athlete. I love watching Darrelle Revis, of course, and Asante Samuel is another guy. I just love watching defenses play, not just corners. Jon Robinson: Any advice for fans who are going to play as your character in "Madden" this year? How should we best utilize your skills? Action on Showtime. Highly recommend.